You are an athlete in your chosen sport, and have just been chosen to represent your country after the #1 ranked athlete was disqualified. You are the parent of an athlete in your chosen sport, and your child is about to win a medal. You are a spectator, watching the final, tie-breaking round of your chosen sport. You are an athlete in your chosen sport who has already been to the Olympics twice without medaling. You know this will be your final Olympics, and it is starting to look like you might not win a medal. You are an athlete in your chosen sport who has suddenly been caught in the middle of a huge scandal. Completed submissions can be turned in at the Library, or emailed to sara.k@rochesterlibrary.org. You are not required to include your name with your submission. 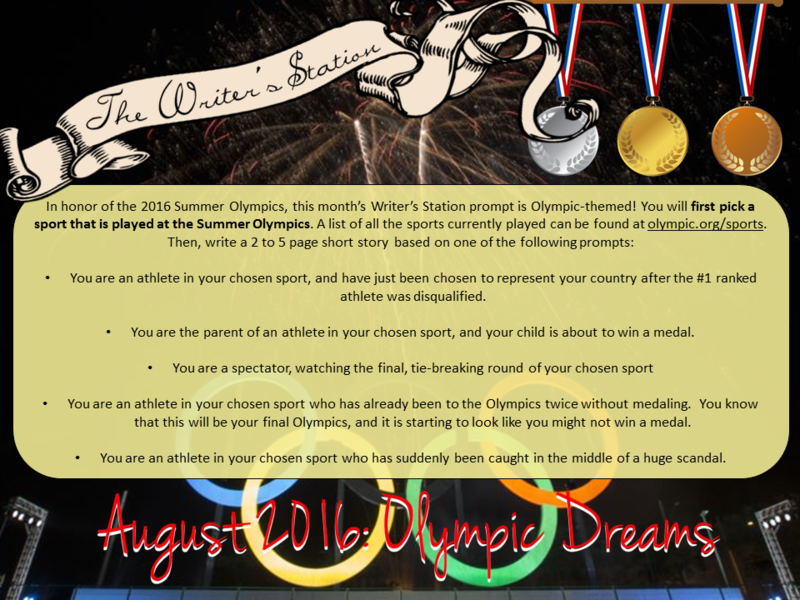 All submissions will be added to the Writer’s Station inside the Library, as well as posted online to our Writer’s Station blog.